Anniversaries. Some are huge, like the one marking the day you were married. Some are smaller, like the one marking the day your smartphone contract is finally complete and you can upgrade your phone. Last weekend I had one that falls somewhere in between those two events, though I am really looking forward to my next smartphone contract and the upgrade. 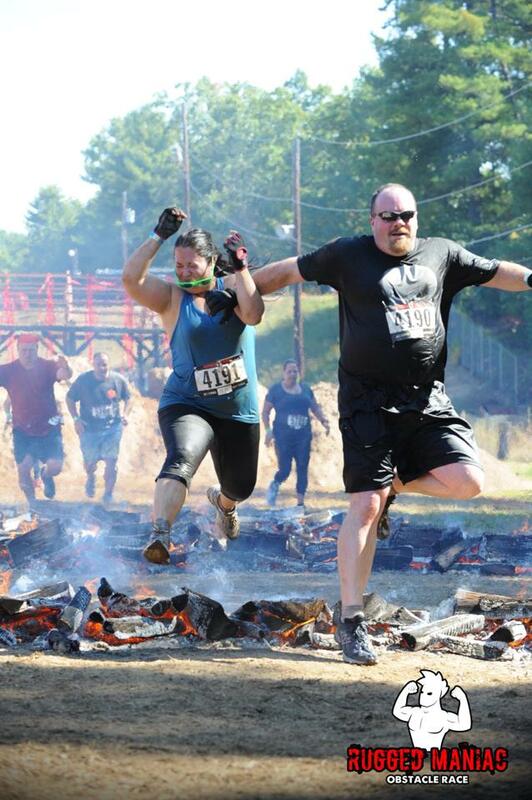 Last weekend was one year from my first obstacle course race, the Rugged Maniac 2013. How did I celebrate, by running the 2014 edition of course. One of the best things about any anniversary is the chance to take stock of where you were then and where you are now. One year ago I was getting ready to run a race that scared the heck out of me. I had signed up and drafted a couple of friends to run with me, but I was still scared. I hadn’t trained enough. I could barely run a mile, let alone three. 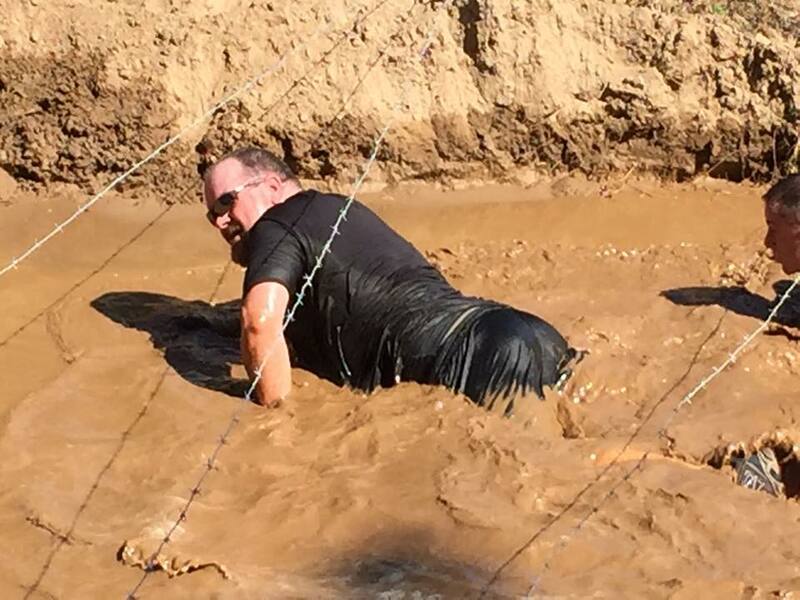 I hadn’t tried climbing walls or crawling under barbed wire. I almost fell jumping over the wall into the starting pen. I was out of my depth and not ready for what was to come. I ran, I walked, I trudged. I jumped fire, climbed walls, and fell into mud pits. I crawled under wire and through pipes. With the support of my friends I finished. I also vowed to do better. To be better. And then I spent most of the winter hurt and not training. I slid backwards. I struggled through the 5 Boro Tour and started to heal. I trained and ran other races. Somehow I managed to run a Spartan Race. That almost killed me, but it also showed me where I could go if I tried hard enough. I ran more 5Ks. I actually ran 5Ks without stopping. I still managed to occasionally injure myself, but I was so far past where I was a year ago when the time came to run again. I hurt my hand, but everything else was mostly healed. It would be the first obstacle race of the summer where my back or my feet wouldn’t be a challenge to overcome, both felt great. My hand injury was only a severe strain to one finger in my right hand, so it wasn’t something that would seriously hamper my efforts. I was more ready for this race than anything I had attempted all summer. So what did the organizers do? They made the course much more difficult. Excellent! To be honest, the year before was not that difficult. I completed the obstacles when I wasn’t in that great of shape. The running is what I failed at the year before. This year the obstacles were much more challenging, and a lot more fun. My only complaint this year was the amount of time crawling under barbed wire seemed crazy. There were four or five sections but all were a little different. There was crawling under wire through deep water, through mud, up hill, and one memorable section had racers crawl through a pipe, into water, under wire, then pull themselves up a rope through another pipe. There were a lot of new or improved obstacles this year. There was a warped wall, a section of hanging rings to be crossed like moving monkey bars, and a balance beam with huge punching bags blocking racer’s progress. There were many walls and cargo nets to climb as well. The organizers added a sand bag carry and an unstable pontoon bridge as well. There was also the huge waterslide and the fire jump, always crowd favorites. There was the added challenge of frigid water. The cold temperatures the night before the race had the water extremely cold. Most racers look forward to the water obstacles during a race as a way to cool down, but this time it was a real penalty to fall into the water. All in all the race organizers did a great job. There was a great balance of running and obstacles and there was almost never a real wait to attempt a challenge. The course was in great muddy shape and the 15 minute split between waves gave each group enough space to feel like we weren’t part of a huge crowd. This race was nowhere near as physically or mentally punishing as the Spartan Race, but I don’t want it to be. This race is the most fun I have had this season because it split the difference between something as purely fun as the Ridiculous Obstacle Challenge and the Spartan Race. Rugged Maniac also had the best finishing festival of the races I ran this season. Live bands, a free beer, and great food were just the start. There was a mechanical bull, merchandize tents and an indoor bar. They also had the best viewing station as the race is run on a motocross track. In a brilliant move, the organizers also offered instant registration for next year’s race at a huge discount. I know many racers immediately signed up for 2015 on price and convenience alone. After all of the on course improvements it was a very easy sell. More on 2015 at the end of the post. How did this year’s team do? Amazing, if I do say so myself. We covered the new obstacles, struggling but overcoming most of them. We all fell at one point or another. The ring traverse was hard on my hand, and I never got up the warped wall. I was sure of failure but I ended up attempting it anyway. Yes, I failed, but not as bad as I thought I would. If it were earlier in the course instead of the last obstacle I might have made it. While the team didn’t fail the fire jump, Angie viciously assaulted my injured hand while jumping the last section. One year later I could also gauge my progress, and that might be the sweetest way to celebrate this anniversary. I ran far more of the course than I thought possible the year before. We ran between obstacles and covered most of the running sections by actually running. Yes, we walked up the one killer hill, but we were still vastly improved. Yes, I struggled in places, but the added level of difficulty made the course more fun and let me push myself much harder than last year’s edition. I finished, not as spent as after the Spartan Race, but more satisfied. This was the first race I had something to compare myself too, and I was pleased with the result. When you register, click “Join a Team”, choose bigjoessoapbox.com and add the team captain name of “Johnson”. That’s it, you’re on the team! Feel free to message me with any questions, but yes, you are ALL invited to run! I really hope that as many of you as possible sign up and run with us! 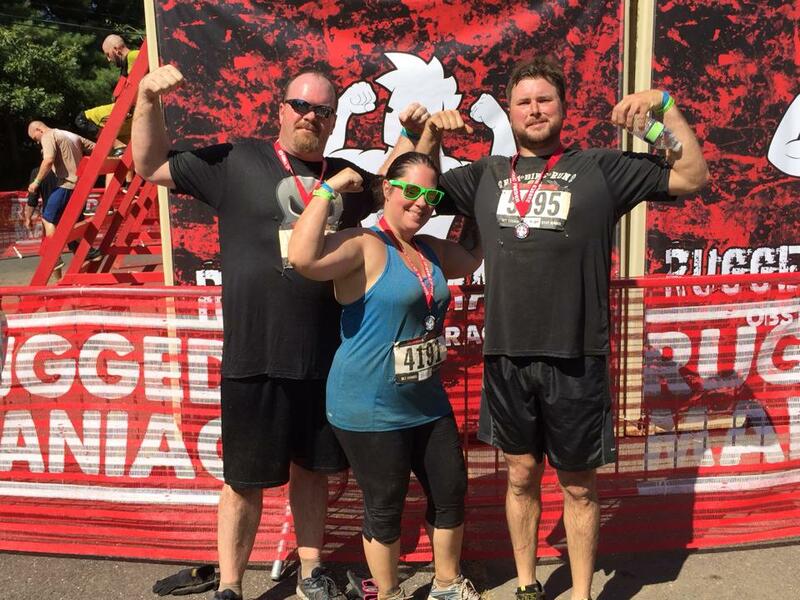 This entry was posted in Uncategorized and tagged 2015 Invite, Anniversary, Maniac, Mud Run, Obstacle Course Race, Race Review, Rugged Maniac, running, Team Race. Bookmark the permalink.